When we first raised the threshold - from 5,000 to 25,000 - we called it "a good problem to have." Turns out that "good problem" is only getting better, so we're making another adjustment to ensure we're able to continue to give the most popular ideas the time they deserve. 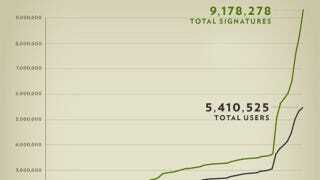 As we've seen overall use skyrocket, more petitions are crossing the threshold - and doing so much more quickly.